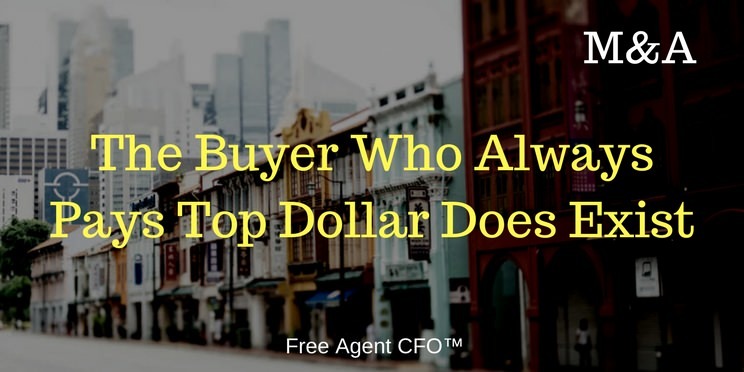 What Type of Business Buyer Will Pay Top Dollar? Yep, there are just two types of business acquirers–strategic buyers and financial buyers. But we want the third kind. You know, the ones that will pay top dollar plus much more. Strategic buyers are always top of mind. When you and I start brainstorming with our clients who could buy their businesses, we always start with competitors or others who know the industry very well. It only makes sense, right? The other type of buyer is probably not as prevalent in our client base–the financial buyer such as the PEG (private equity group). I’m also going to lump in the person with lots of cash on the sidelines looking for other small businesses to acquire to diversify their investments. We might even have some current clients that do this. Several years ago, I was helping a small $3 million service business buy a competitor about 5 hours from their home office. We made a great offer. We wanted to keep the seller involved too. He was happy, or so we thought. I can’t beat that person. Neither can you. There’s only one strategy to deal with The Idoiot–wait them out. They will eventually crash and burn. Your client will be there to pluck off the customers that leave en masse. If you are working with a seller, finding The Idiot is great. Good luck finding that person. And yes, it’s all about luck. Just curious, have you encountered The Idiot in past deals? What did you and/or your client do? Incidentally, I’m sticking with the term, The Idiot. Nincompoop just doesn’t resonate in this type of discussion. Mark Gandy is the Head Coach and General Manager of Free Agent CFO™. Mark entered the game of CFOing in 2001 and practices under the brand G3CFO. Through coaching, teaching, and inspiring, he wants to help other CFOs, small CPA firms, and business consultants take their CFO game to a whole new level. Do You Have a Contact Submission Form on Your CFO Website? Get in the game, stay in the game, win the game. Not just for you but for the clients you serve.